It’s been a bountiful harvest on the Kitsap Peninsula. Everywhere there are apple, pear and plum trees are bearing tons of fruit. In my yard, the three apple trees, Italian plum and two walnut trees are keeping me pretty busy. The race began in earnest the end of August, picking blackberries before the heat of the day. Next on the to do list were apples. I froze them, thawed them and then pressed them for some of the sweetest cider I’ve ever tasted. Then I fermented 5 gallons of cider, baked couple of apple cakes, cooked up a dozen jars of apple sauce and when I ran out of jars, sliced over 30 pounds of apples and dried them. 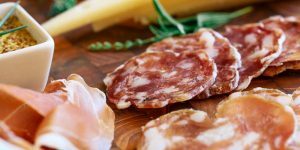 It’s a great snack, especially when accompanied with a thin slice of cheddar and a glass of Riesling. The plums were plentiful too. They accompanied me to every meeting I went to. Out of town guests were sent packing with a bag of plums and apples. Plum tarts, plum wine and jars of spicy plum sauce now occupy my kitchen. I will trade a plum tart for a bottle of wine. In my spare time, I helped out with crush at a few Bainbridge Island wineries. 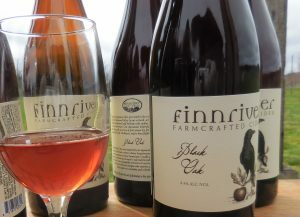 At Perennial Vintners last month, bottling was the order of the day. Because that’s what you have to do in a small winery to make room for the coming harvest. There is only so much room for a limited amount of tanks. And this time of year, tanks are needed. Whites are bottled and reds go into barrels. At Perennial, the wine was pumped from the tanks into a smaller container about the size of an aquarium with six spigots. Next, bottles were gassed and then filled, corked and labeled by a crew of volunteers under the direction of owner/winemaker Mike Lempriere. He’ll be harvesting Müller -Thurgau from the Puget Sound AVA soon. At Eleven Winery, owner/winemaker Matt Albee crushed Elephant Mountain Syrah and Viognier in mid-September and then Tempranillo. This week, the Lemberger is scheduled to arrive. Wine grapes arrive in big tubs called lugs. The lugs are so full of grapes, they’re moved around with a fork lift. Albee had devised a system to tilt the tub with the fork lift so one volunteer can rake the grapes onto the moving conveyor line where two volunteers remove leaves, bugs and dried grapes. As the grape bunches reach the top of the conveyor, they fall into the crusher/destemmer. Stems fall into one lug and crushed berries fall into another. When crushing is finished, the lugs are moved into the winery, treated with SO2 and covered with a cloth sheet to allow the sulfites to do their job of killing wild yeasts before off-gassing for 24 hours. After that, the yeast culture is added and voila! Fermentation begins. Belfair’s Mosquito Fleet Winery has a similar setup however, their sorting tables are manned by at least a dozen enthusiastic volunteers who pick out the dried berries, leaves and other debris that are not Petite Verdot and Malbec grapes. It’s a convivial event with owners Brian and Jacquie Petersen and Scott and Jacy Griffin; lunch and, of course, tastes of award winning wines. Small wineries welcome and take very good care of their volunteers. With anticipation and apprehension, winemakers keep tabs on their vines and weather at harvest time. It’s the age old winemaker question, when should picking begin? The answer, my wine friends, is blowing in the wind and different for each grape variety. Some are early ripeners, like Syrah and some are late ripeners, like Cabernet. At an estimated 268,000 tons, the 2018 harvest in Washington is likely to be bigger than last year but not as big as 2016. That year holds the record for grape harvest at 270,000 tons. In contrast, Oregon’s harvest is estimated around 85,000 tons, on par with their 2015 record crop. And in British Columbia, harvest was at an all-time high of 32,700 tons. A staggering two-thirds of Washington’s grape harvest is handled by Ste. Michelle Wine Estates, which includes brands such as Columbia Crest, North Star, Intrinsic, Col Solare, Seven Falls, 14 Hands, and, of course, Ste. Michelle. Much of the growth is due to 58,200 acres of new vineyards that have matured. Most of these plantings are in established AVAs. But hold on to your hat – five new AVAs are on the docket. Applications for Goose Gap, Royal Slope, The Burn, White Bluffs and Candy Mountains have been filed. It’s a busy time of year in but somehow the Yakima Valley wineries manage to harvest, crush and celebrate. They invite you to celebrate their bountiful harvest during the Annual Catch the Crush on October 13th and 14th. Each winery offers its own celebratory activities such as grape stomps, crush activities, tours, free-run juice, hors d’oeuvres, live music, and of course, wine tasting. If you purchase a Catch the Crush Premier Pass, you’ll enjoy exclusive food pairings, library tastings and tours. Wineries ask you to bring your own glass, photo ID and designated driver for this annual wine adventure. Cheers! The Kitsap Wine (and beer and cider) Festival is fast approaching. For the tenth year, it continues at Harborview Fountain Park on Bremerton’s inviting waterfront. Since it began in 2008, the festival has featured live music, delicious bites from local restaurants and, of course, mostly Washington wines (and lately local beers and ciders). This is a great opportunity to explore and discover new and emerging wines without a trek into the crazy traffic across the pond. Wineries to check out include Belfair’s Mosquito Fleet Winery which placed in the top 3 of the Seattle Times’ 50 best wines of 2017. Other Washington, Oregon and California wineries to become familiar with are California’s Ava Grace Vineyards, Port Angeles’ Camaraderie Cellars, Davenport Cellars is back, Eaglemount Winery & Cidery from Port Townsend, Walla Walla’s Eleganté Cellars, Bainbridge’s Eleven Winery, Port Angeles’ Harbinger Winery (bring the Barbera! ), Hoodsport Winery (Island Belle? ), Long Cellars (Petite Sirah and Dry Riesling, please) , Masquerade Wine Company (Syrah, sirah, please, oh please) Michael Florentino Cellars, Naches Heights Vineyard, Nota Bene Cellars, the one year old Port Townsend Vineyards, Scatter Creek Winery (Key Auntie? ), Silvara Cellars, Stina’s Cellars ( bring the ice wine!! ), Red Mountain’s Terra Blanca Winery (I love you, Onyx), Trinchero Family Estates, Williamette Valley Vineyards, Wind Rose Cellars (Dolcetto? Primitivo?) and the Winery Alliance of Bainbridge Island. For several years now you can also buy your new favorite wine at their on-site wine shop. Proceeds from the Kitsap Wine (and beer and cider) Festival benefit Olympic College Alumni Association programs supporting student success. WHEN: Saturday, August 11, 2018 from 2 p.m. to 5:15 p.m.
Wine is Fun. That’s what Eleven Winery’s winemaker/owner Matt Albee believes. And it certainly was fun one sunny Saturday during Wine on the Rock. There were even some bicyclists pedaling from winery to winery. All of the Bainbridge Island wineries were open and pairing their wines with chocolate. But not just any chocolate. These were local chocolatiers making some incredibly good candies. Bon Bon, Pink Peony, L’Atelier, Powell and Jones, some wineries had chocolates made with their wines and one winery served up a homemade chocolate éclair. The Eleven Winery folks were pouring their gold medal winning Syrah from Elephant Mountain Vineyard with a Bon Bon dark chocolate fudge made with the wine. That was the best fudge I’ve ever tasted. Another sweet match was the Sweet Sarah port-style wine also made with Syrah. It was served in a festive chocolate cup. Fletcher Bay’s new digs in the Coppertop Loop business park had Powell and Jones Chocolates, a relative newcomer to Bainbridge. Their truffles were beautifully crafted and delicious. They paired well with the heavenly scented 2015 Walla Wallla Cab from Oidos Vineyard. An interesting trend for a few BI wineries is the use of French, Hungarian and Virginian oak before blending the final product. It seems to be the right thing to do for this wine. A very, very good wine. Fletcher Bay also poured their Yakima cherry wine that was not too sweet and not too dry. And yes, the wine naturally went well with the dark chocolate. Eagle Harbor’s owner Emily Parsons’ passion is Bordeaux. The 2014 Founders Merlot from a vineyard in Walla Walla had a beautiful nose and great balance. While the 2014 Cab also had a gorgeous nose, it leaned toward the mineral and cedar side of the aromas wheel. Consultant Hugh Remash was on hand to pour the 2013 Raptor, a blend of equal parts Cab Franc, Cab and Merlot with a drop of Petite Verdot. It received top honors in Seattle for best Bordeaux style blend in 2017. It’s well polished with a long finish. It was great fun comparing it to the 2014 Raptor, a blend of Merlot, Cab and Cab Franc. I preferred the 2013 but I’m pretty sure next year I’ll be saying that I preferred the 2014 to the 2015. These big wines age gracefully. The wines were matched with chocolatier L’Atelier whose shop is set up across the parking lot from Eagle Harbor. You need to go there. This is the ultimate in eye and eatin’ candy, everything was so beautiful. They also make pastries, so having had plenty of chocolate, we decided to share a buckwheat pastry. Next time, it’ll be a Belgian cheese waffle. Amelia Wynn’s Crawford Vineyard Yakima Valley Orange Muscat sports a bright citrusy label. It was awarded 2017 Seattle Wine Awards Best of Class and #2 of the Top 50 White Wines! The wine is dry yet fruity and the perfect match with the chocolate éclair. Their 2014 Duovin Merlot was from the Dwelley Vineyard in Walla Walla. It had a wonderful nose and rich flavors with a long finish. It seems the folks in San Francisco agree, they awarded a gold medal to this wine. The 2016 Den Hoed Vineyard Tempranillo was another three star wine for me with its cherry nose and flavors with light herbs. Nicely balanced with a long finish. This one took a double gold in 2018 San Francisco. The 2014 Sangiovese from Red Mountain’s Kiona Vineyard also took home gold at the 2018 San Francisco competition. I had another éclair, that gets a gold in my book. Rolling Bay has new location out in the country near Bay Hay and Feed. Their 2015 Malbec earned a star in my book and the 2015 Uplands Vineyard Cab Franc won a silver in San Francisco. My favorite was the Cuvee Aldaro a blend of 78% Cab, 12% Cab Franc and 10% Merlot. Pink Peony on Bainbridge Island made the dark chocolate bites. Caramel salted, cherry and one spicy one. Loved these chocolates. They can be purchased at Bon Bon Chocolates. Bainbridge Vineyards served up a lovely handcrafted chocolate made with and accompanied by their Raspberry wine. We were the last ones in the door at Perennial Vintners. We were delightfully surprised by the Siegerrebe, a highly aromatic grape that is a cross between Madeleine Angevine and Gewurztraminer. This dry white table wine would pair perfectly with fish or a light chicken dish. But not bad with the cheesecake either. Next month is Washington wine month culminating in the largest single region grand tasting otherwise known as Taste Washington. I highly recommend this extensive tasting to build your knowledge of some of the over 850 Washington wineries. Summer is a highly social time with barbeques, picnics, dinner parties, wine tastings beer events and vacationing family and friends. Being the considerate person that you are, you should arrive on your host’s door step with something more than your sparkling personality, stunning though it may be. It’s better to err on the side of graciousness and put a little joy in someone’s life. 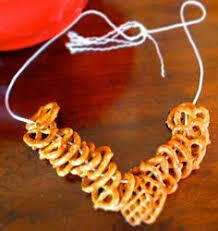 Bringing a hostess/host gift is easy. Even if it seems like bringing coals to Newcastle, do it. But personally, I draw the line if there is an animal on the label or wines produced in Modesto, California. Other friends may not be so finicky. So, bring your hostess/host a really nice bottle of wine. Select something in the $20-30 range that looks intriguing and is highly recommended by anyone with some sort of credentials. Buying something because it has a cool label is out. Them are the rules. On a recent high school/college buddy reunion in the wild, wild west town of Livingston, Montana, we brought a case of Pacific Northwest wines, home-smoked salmon and a bucket of frozen blackberries. Yep, we blew their socks off with the wines and salmon. And that jug of wine with the yellow animal on it was strategically positioned in the far corner of the kitchen counter. I’m out to impress my friends, right? So popping the cork on this cellar dweller makes perfect sense. Ch. Ste. Michelle Ethos Columbia Valley 2007 Reserve Merlot was awarded a national wine magazine’s Editors’ Choice Award. That’s pretty special, and so was this almost 10-year-old. Ripe, round, toasty and medium-bodied, this is a classy wine, especially for the price. A ton of black cherry, cassis, spice and toast is seductive. The tannins have smoothed out after all these years. What a beautiful wine. A little further north of the Rogue Valley is the cool Umpqua Valley. There lies the Reustle Prayer Rock Vineyards. Owner winemaker Stephen Reustle is a cool climate specialist and has a thing for low yields and clonal selection. It’s no wonder they were awarded the 2017 Northwest Winery of the Year. I thoroughly enjoyed their well-balanced Gruner Veltliner Winemaker’s Reserve. This little-known grape variety is estate grown from vineyards on steep, south-facing hillsides. Very much like its native Austria. Terra Blanca 2016 Arch Terrace Rosé is a blend of mostly 66 percent Sangiovese with 34 percent Cabernet Franc. Beautiful fruit and great balance make it a fabulous match with summer fare whether picnic, patio or bbq. It’s well-balanced, with lush, tropical fruit and crisp lively acidity on the finish. Stainless steel fermentation followed by extended sur lie aging heightens the beautiful fruit while creating weight and structure all balanced by the crisp acidity. This wine has some complexity to it. 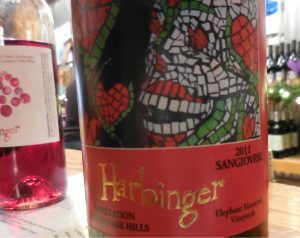 Harbinger Rattlesnake Hills Two Coyote Vineyards Viognier is a blend of 76 percent Viognier and 24 percent Roussanne. These two varietals have been blended since Hector was a pup in the Rhône. I love how Sara Ganon, owner/winemaker, describes her wine. “Viognier loves to pour on the fruit, but struggles with structure, while Roussanne can sometimes be a bit like engineers — so focused on load support, they forget to stop and smell the honeysuckle.” This wine boasts heady aromas of honeysuckle, tropical fruit, ripe pear, lemon and spices. It’s pretty much heaven in a bottle. Established in 2010, Kevin White Winery set out to produce limited, hand-crafted wines that pair well with food. Founders’ love for Rhone Valley wines naturally led to a focus on Syrah, Grenache, and Mourvedré. The Kevin White 2013 Columbia Valley Mourvedre was a wine that hit it out of the park. It’s a blend of one barrel of Boushey Vineyard Mourvèdre and one barrel of Olsen Estates Vineyards Mourvèdre produced only 42 cases. This medium-body wine has all the traditional spice, pepper, leather and raspberry flavors of a Rhone-style wine, and I was in heaven. It’s meant for grilled foods of all kinds. Domaine Pouillon is a family-owned winery located in the scenic Columbia River Gorge. Grapes are hand-picked in small lots, aged in neutral French oak, or neutral oak and stainless steel for whites. Vigneron Alexis Pouillon was born to an obscure family of French nobility that escaped the guillotine. After the dividing up the family estate, his share was a 4-by-7 meter plot of land with a 3-wheeled Deux Chevaux and feral cat. He abandoned the cat to go and work at Chateau de Beaucastel. That accomplished, he came to America to seek his fortune, thank goodness! His travels brought him to the Columbia Gorge, the “world of wines in 40 miles.” The 2016 Black Dot McKinley Springs Vineyard is a very interesting blend of 33 percent Zinfandel, 28 percent Syrah, 24 percent Cabernet Sauvignon and 15 percent Dolcetto. All cranberry, raspberry and plum sprinkled with white pepper make this wine an award-winning, grilled-foods-smoked-salmon kind of wine. And, of course, I had to bring a wine from Kitsap. Alphonse de Klerk’s Rolling Bay 2014 Syrah has garnered some gold and silver in regional competitions. This Bainbridge Island winery sources its grapes from south-facing rocky slopes on Snipes Mountain, an excellent site for Syrah. This wine was elegant with wonderful aromas and flavors. It made a great impression. The trip was a reminder of the importance of good food, great people, and wonderful wine. Cheers! Mary Earl has been educating Kitsap wine lovers for a couple of decades, is a longtime member of the West Sound Brew Club and can pair a beer or wine in a flash. The 6th Annual Washington Wine Awards was held last week. About 40 wineries were pouring with some wonderful bites presented by local restaurants. It was a heavenly event. So what did I learn? Well, grab a glass of wine and pull up a chair as I tell you about some of my favorites that evening. A new find was the Ashren 2016 Columbia Valley and 2014 Celilo Vineyard Chard. Winemaker Chris Gorman sources his grapes from some of the best vineyards – Conner Lee, Boushey and Celilo. While rather high at 14.4% alcohol, you couldn’t taste it, it was so well balanced. Both spent 9 months in neutral oak also contributing to the fullness and balance. Airfield Estates on Merlot Drive in Prosser poured their 2015 Yakima Chard. This wine was so easy to sip with 70% fermented in stainless and only 30% aged in neutral oak. Crisp, medium bodied with pear and apple aromas and flavors. It’s a summertime wine. Next I beat feet to Cadence but with several bodies blocking my way, I waited my turn at Canvasback next door, one of the newest wineries on Red Mountain. What makes this such a storied wine is its California roots. Owned by Duckhorn of Merlot, Cab and Sauvignon Blanc fame, they’re making wine from the Obelisco and Quintana vineyard grapes while waiting for their vines to reach maturity (seven years old). Winemaker Brian Roudin apprenticed at Cadaretta in Walla Walla. You need a bottle of this. Cadence was pouring the 2013 Red Mountain Bel Canto, a blend of 75 Cab Franc and 25 Merlot which is the inverse of some great Pomerols with their 75 Merlot and 25 Cab Franc. The breadth and depth of aromas and palate was amazing. Sparkman Cellars Wilderness 2014 Syrah was being poured. It went very nicely with the Tulalip Casino’s Pork Belly sushi. I was also drawn to their wonderful 2015 Kindred, a Bordeaux blend. He makes great wines – really. I thoroughly enjoyed Purple Star Winery’s 2013 Cab, a blend of 90% Cab with the remainder Merlot and Petite Verdot. And Dusted Valley’s 2013 Cab, a blend of predominantly Cab, with Petite Verdot and Cab Franc from Dionysus Vineyard is another wine that garnered 3 stars from my pen, along with Long Shadows Chester Kidder’s 2014 Red Blend. Newsprint Winery’s 2014 Red Blend is another not-to-be-missed BBQ wines. And finally, in a garage in Woodinville is Kevin White Winery, near and dear to me. His 2015 Yakima Red and 2014 DuBrul Red well worth seeking out, if you can find them. Truly. OK, last one, Treveri Cellars Blanc de Noir was absolutely perfect as always but with the Tulalip Casino’s Butter Poached Prawns with Dungeness Crab, Ginger Lime Vinaigrette and Wasabi Tobiko, we’re talking heavenly. Both those guys really nailed it. The Kitsap Wine Festival at Harborside Fountain Park is next Saturday. This revelry of wine, set on Bremerton’s scenic and sunny waterfront, is one of the best on the Kitsap Peninsula. The 9th annual festival begins at from 2 and ends at 5:30 p.m. Tickets are $65 from Brown Paper Tickets which includes a Kitsap Wine Festival commemorative wine glass and 15 scripts. Kitsap Peninsula’s Winery Alliance of Bainbridge Island will be there also. The Winery Alliance includes Amelia Wynn, Bainbridge Vineyards, Eagle Harbor, Eleven Winery, Fletcher Bay, Perennial Vintners, and Rolling Bay Winery. 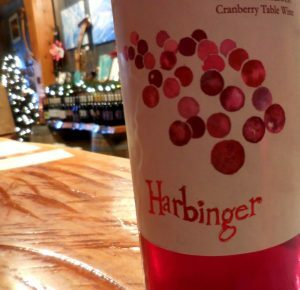 Harbinger Winery is an artisan Olympic Peninsula winery focused on making fabulously drinkable wines with varietals that aren’t mainstream. Sara Gagnon, owner and winemaker, has made great wines and I hope to taste her Dynamo Red Table Wine, a gold medal winning wine made from mostly Syrah, with a dollop of Cabernet Franc, Merlot, and Grenache. I first met Davenport Cellars owners Jeff and Sheila Jirka at a Kitsap Wine Festival a few years ago. Located in the warehouse district of Woodinville, they source their grapes like most from eastern Washington. Their Continuity is a Bordeaux blend of 71% Cab, with the remainder being Merlot, Cab Franc, Malbec and Petit Verdot. Fruit sources include Walla Walla’s Pepper Bridge and Les Collines, Sheridan Vineyard in Rattlesnake Hills, and Kiona on Red Mountain. Also new to me from Woodinville, is Long Cellars, a boutique winery whose primary mission is to produce fine Bordeaux styled wines from vineyards located in the Yakima Valley AVA, the oldest AVA in Washington. Eleganté Cellars is another winery that’s been around since 2007. They also make wine from Les Collines which is in the foothills of the Blue Mountains, in the Walla Walla AVA. Their Gewürztraminer grapes come from 35 year old vines from Celilo Vineyards. Stina’s Cellars in Lakewood caught my attention after having won a bottle of Ice Wine at auction last winter. They have won a number of awards for their 2013 Wahluke Slope Tempranillo and a gold medal at the Capital Wine & Food Festival for their 2012 Yakima Valley Malbec. Finally, many Oregon wineries will be in the direct path of the total solar eclipse on August 21st. Viewing totality among the grape vines in the Willamette Valley could be just the kind of celebration you haven’t experienced on a Monday morning. Willamette Valley Vineyards’ sold out event offers parking, eclipse viewing eye-glasses, wine tasting, educational presentations, a commemorative Solar Eclipse Pinot Noir and live music for $100. For ticket holders arriving ahead of the traffic, gates open at 0400! 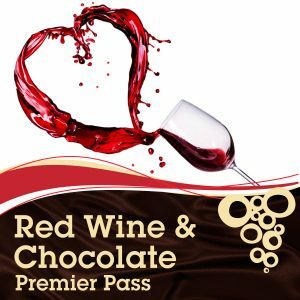 Grab your sweetheart (or friend) and visit all seven Bainbridge Island wineries to celebrate Valentine’s Day with wine and chocolate. 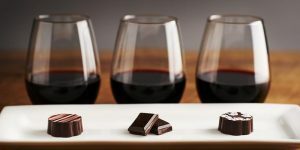 Wine on the Rock: Wine and Chocolate will be an unforgettable Valentine’s wine tasting event. Saturday, February 11 and Sunday, February 12, 12-5pm.